Exercise by itself is not the way to treat diabetes. Your care plan should include working closely with your doctor to achieve a balance between medication, diet and exercise. Though exercise can be very valuable for type I and type II diabetes, be sure you receive a pre-exercise medical evaluation. It is recommended that for both types of diabetes you should be exercising 3 – 5 days per week. This would include strengthening and aerobic exercise that lasts at least 30 minutes. Diabetics should also avoid exercises that may increase their blood pressure including overhead arm work, stressful isometric exercise and heavy weights. This is very important for those with retinal problems. 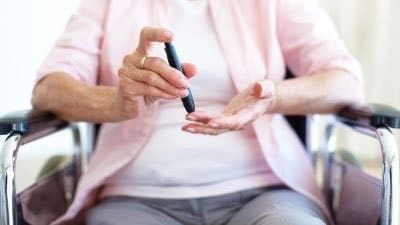 Those with elderly diabetes should generally avoid aerobic classes that perform high impact movements. Certainly if you have retinal problems, foot ulcers, or peripheral neuropathy this jarring movement is not good. If you have obtained medical clearance for exercise you may follow any generally safe senior exercise class format with a slow progression. Make sure you space out your workout over the week to maintain the positive exercise benefit of increased insulin sensitivity. You should be very familiar with how you feel when the symptoms of a diabetic emergency appear so you can obtain quick treatment. This includes both hypoglycemia and hyperglycemia. Type I diabetics should be aware of ketoacidosis when experiencing hyperglycemia. This is a dangerous accumulation of ketones in the blood causing acidosis. This can result in a coma if left unchecked. If you are using medication it is possible to experience late-onset hypoglycemia up to 48 hours after you exercise. Those with elderly diabetes can prevent this by working closely with your doctor and dietitian to adjust diet and your medication.